Whether you’re a pianist looking to expand into the world of duets, a guitarist looking for a band, or a singer looking to sing in an a capella group, we’ve got you covered. The Holidays are coming up and what better gift is there than to give someone something they can enjoy for a lifetime. On Tuesday September 11, Rivertown Music Studio will open its doors again! We're excited to welcome back our returning students and look forward to working with our new students! Sign up today, spots fill up fast! Join us on Sunday, February 11th, for the Tappan Zee Manor Performance! Our school year so far is coming along! We still have some slots open for students of all ages and skill levels. Come join us, register today! Join us Sunday, April 23rd for the annual Composition Festival! 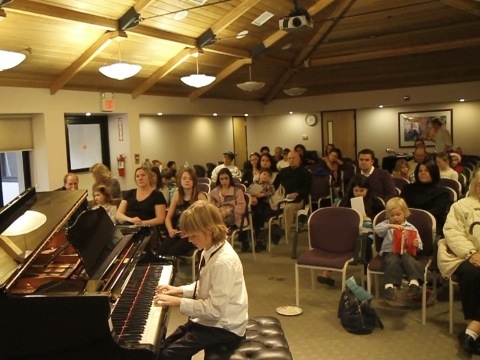 One of the most creative and fun recitals of the year. The Concert will start at 2:00 at a venue to be determined. There will lots of original music being premiered! Hope to see you there. Register now for Rivertown Music Studio's 2017 Music+Arts Camp. This is the camp everyone was raving about last summer. Cool breezes off the Hudson River in Nyack at the beautiful CSI Building. Lots of fresh air, belly laughs everyday, music, storytelling, arts & crafts, morning Yoga, improv, singing and one private music lesson each week. Ensemble Class - Enroll now! Our first ensemble class is under way, making music and having a blast! Building a sense of community in a student's musical journey is extremely important. Join other friendly, excited and music-loving students in a full band or ensemble, with room for vocals, guitars, keyboards, bass, drums and more. Registration is ongoing and open to students of all ages. Register soon for your choice of day/time slots!